The average American uses three or more devices to access the Internet throughout the day. For marketers, this means budgets for cross-device campaigns are on the rise. Digital media budgets for cross-device campaigns have increased 24 percent from last year. And a survey conducted by Nielsen and the Association of National Advertisers suggests that U.S. marketers expect the share of their budgets allocated to multi-screen campaigns to increase 50 percent by 2016. Multi-screen campaigns were defined as those that run during a similar timeframe across two or more screens including TV, computer, tablet, mobile phone and digital place-based media. Measurement is the biggest issue for multi-screen advertisers. The majority (71 percent) said they use a variety of metrics specific to individual screens, but 73 percent said they would prefer to use just one set of metrics across all screens. In most instances, the entire path to purchase doesn’t happen on just one device. We switch between our gadgets as we move from home to car to office to coffee shop and so on. For example, consumers often start shopping on one device, then finish shopping on another. Or in the case of second screen campaigns, people might watch a favorite show on a television, but also concurrently use a phone or tablet to engage on social media networks. You also have those who like to multi-task by doing two unrelated things on separate devices. The challenge is to create a fluid cross-device experience that works seamlessly and tells an integrated story. And remember — it’s not just a matter of telling the same story or serving up the same experience across all devices. But it’s also not just about creating a device-specific strategy. Instead, all the components of your strategy need to work together and take multiple devices into consideration. It’s our job as marketers to better understand the intent signals that our customers are exhibiting, and then reach the most valuable customers at the time and place that they are most likely to convert. That approach is device-agnostic, and in many ways our strategy should be as well. Marketers need to focus on the individual and how they interact with that individual on every device. It’s not enough to understand how I browse your site on my phone. You need to understand what I do when I put my phone in my pocket and sit down at my desk. Am I the type of person who kills time by flipping through my favorite flash sale site on my phone but will only convert on my desktop computer? Or am I likely to actually make the purchase right there on my phone? It is becoming increasingly common for customers to interact with brands on multiple devices. Therefore, if you fragment your strategy based on device, you are only taking part of the story into account. 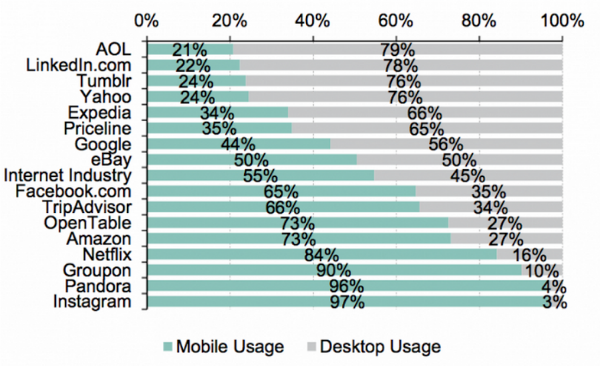 In 2014, the major players in desktop are going to become the major players in mobile as well, which will make it possible for marketers to launch powerful cross-device performance campaigns. Always remember to focus on the consumer, not on the device or channel. Google recently launched a new AdWords system called Enhanced Campaigns, which it’s pitching as a better way to advertise across multiple devices.